Extracting trehalose was once a difficult and costly process, but around 2000, the Hayashibara company (Okayama, Japan) discovered an inexpensive extraction technology from starch. 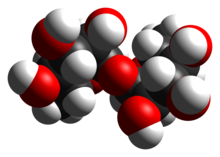 Trehalose has high water retention capabilities, and is used in food, cosmetics and as a drug. Trehalose is a disaccharide formed by a 1,1-glycosidic bond between two α-glucose units. Two other isomers are not found in nature. It is found in nature as a disaccharide and also as a monomer in some polymers. At least three biological pathways support trehalose biosynthesis. An industrial process can derive trehalose from corn starch. Trehalose is a nonreducing sugar formed from two glucose units joined by a 1–1 alpha bond, giving it the name α-D-glucopyranosyl-(1→1)-α-D-glucopyranoside. The bonding makes trehalose very resistant to acid hydrolysis, and therefore is stable in solution at high temperatures, even under acidic conditions. The bonding keeps nonreducing sugars in closed-ring form, such that the aldehyde or ketone end groups do not bind to the lysine or arginine residues of proteins (a process called glycation). Trehalose is less soluble than sucrose, except at high temperatures (>80 °C). Trehalose forms a rhomboid crystal as the dihydrate, and has 90% of the calorific content of sucrose in that form. Anhydrous forms of trehalose readily regain moisture to form the dihydrate. Anhydrous forms of trehalose can show interesting physical properties when heat-treated. Trehalose aqueous solutions show a concentration-dependent clustering tendency. Owing to their ability to form hydrogen bonds, they self-associate in water to form clusters of various sizes. All-atom molecular dynamics simulations showed that concentration of 1.5–2.2 molar, allow trehalose molecular clusters to percolate and form large, continuous aggregates. Trehalose directly interacts with nucleic acids, facilitates melting of double stranded DNA and stabilizes single-stranded nucleic acids. Organisms ranging from bacteria, yeast, fungi, insects, invertebrates, and lower and higher plants have enzymes that can make trehalose. In nature, trehalose can be found in plants, and microorganisms. In animals, trehalose is prevalent in shrimp, and also in insects, including grasshoppers, locusts, butterflies, and bees, in which trehalose serves as blood-sugar. Trehalose is then broken down into glucose by the catabolic enzyme trehalase for use. Trehalose is also present in the nutrition exchange liquid of hornets and their larvae. Trehalose is the major carbohydrate energy storage molecule used by insects for flight. One possible reason for this is that the glycosidic linkage of trehalose, when acted upon by an insect trehalase, releases two molecules of glucose, which is required for the rapid energy requirements of flight. This is double the efficiency of glucose release from the storage polymer starch, for which cleavage of one glycosidic linkage releases only one glucose molecule. In plants, trehalose is seen in sunflower seeds, moonwort, Selaginella plants, and sea algae. Within the fungi, it is prevalent in some mushrooms, such as shiitake (Lentinula edodes), oyster, king oyster, and golden needle. Even within the plant kingdom, Selaginella (sometimes called the resurrection plant), which grows in desert and mountainous areas, may be cracked and dried out, but will turn green again and revive after rain because of the function of trehalose. The two prevalent theories as to how trehalose works within the organism in the state of cryptobiosis are the vitrification theory, a state that prevents ice formation, or the water displacement theory, whereby water is replaced by trehalose. It is commonly used in prepared frozen foods, like ice cream, because it lowers the freezing point of foods. The Cargill corporation promotes the use of its brand of trehalose, "Treha," as a substance that "enhances and intensifies certain flavors to bring out the best in your products." Trehalose is an ingredient, along with hyaluronic acid, in an artificial tears product used to treat dry eye. In 1832, H.A.L. Wiggers discovered trehalose in an ergot of rye, and in 1859 Marcellin Berthelot isolated it from Trehala manna, a substance made by weevils and named it trehalose. Trehalose has long been known as an autophagy inducer that acts independently of mTOR. In 2017 research was published showing that trehalose induces autophagy by activating TFEB, a protein that acts as a master regulator of the autophagy-lysosome pathway. In January 2018 research was published showing that some strains of Clostridium difficile found in the human gut microbiome are especially responsive to trehalose; the study found that in the lab and in mice, these strains grew better and produced more toxins when fed trehalose. The authors pointed out a correlation between the timing of the introduction of trehalose into the food supply, and a rise in cases of hospital-acquired C. difficile infections. Suggested that trehalose might be causing the rise in infections. It was not known at that time whether trehalose actually caused the rise in C. difficile infections or affects C. difficile in the human gut. ^ Higashiyama T (2002). "Novel functions and applications of trehalose" (PDF). Pure Appl. Chem. 74 (7): 1263–1269. doi:10.1351/pac200274071263. ^ Lide, David R. (1998). Handbook of Chemistry and Physics (87 ed.). Boca Raton, Florida: CRC Press. pp. 3–534. ISBN 978-0-8493-0594-8. ^ Cargill, Incorporated (30 May 2011). "Cargill, Hayashibara to Introduce Trehalose Sweetener to the Americas". PR Newswire. Retrieved 2011-07-31. ^ "JAPAN: Cargill, Hayashibara to Introduce Trehalose Sweetener to the Americas". just-food.com. 2000-05-31. Retrieved 2 February 2013. ^ a b c d Elbein AD, Pan YT, Pastuszak I, Carroll D (April 2003). "New insights on trehalose: a multifunctional molecule". Glycobiology. 13 (4): 17R–27R. doi:10.1093/glycob/cwg047. PMID 12626396. ^ [dead link] "GRAS Notification for Hayashibara Trehalose" (PDF). Food and Drug Administration. May 3, 2000: 10. ^ Sapir L, Harries D (February 2011). "Linking trehalose self-association with binary aqueous solution equation of state". The Journal of Physical Chemistry B. 115 (4): 624–34. doi:10.1021/jp109780n. PMID 21186829. ^ Bezrukavnikov S, Mashaghi A, van Wijk RJ, Gu C, Yang LJ, Gao YQ, Tans SJ (October 2014). "Trehalose facilitates DNA melting: a single-molecule optical tweezers study". Soft Matter. 10 (37): 7269–77. Bibcode:2014SMat...10.7269B. doi:10.1039/C4SM01532K. PMID 25096217. ^ a b Zentella R, Mascorro-Gallardo JO, Van Dijck P, Folch-Mallol J, Bonini B, Van Vaeck C, Gaxiola R, Covarrubias AA, Nieto-Sotelo J, Thevelein JM, Iturriaga G (April 1999). "A Selaginella lepidophylla trehalose-6-phosphate synthase complements growth and stress-tolerance defects in a yeast tps1 mutant". Plant Physiology. 119 (4): 1473–82. doi:10.1104/pp.119.4.1473. PMC 32033. PMID 10198107. ^ Reis FS, Barros L, Martins A, Ferreira IC (February 2012). "Chemical composition and nutritional value of the most widely appreciated cultivated mushrooms: an inter-species comparative study". Food and Chemical Toxicology. 50 (2): 191–7. doi:10.1016/j.fct.2011.10.056. PMID 22056333. ^ Sola-Penna M, Meyer-Fernandes JR (December 1998). "Stabilization against thermal inactivation promoted by sugars on enzyme structure and function: why is trehalose more effective than other sugars?". Archives of Biochemistry and Biophysics. 360 (1): 10–4. doi:10.1006/abbi.1998.0906. PMID 9826423. ^ Mathlouthi, M., ed. (1999). Food packaging and preservation. Gaithersburg, Md. : Aspen Publishers. ISBN 978-0-8342-1349-4. Retrieved 25 June 2014. ^ a b c Collins F (9 January 2018). "Has an Alternative to Table Sugar Contributed to the C. Diff. Epidemic?". NIH Director's Blog. ^ O'Brien-Nabors, Lyn, ed. (2012). Alternative sweeteners (4th ed.). Boca Raton: CRC Press. ISBN 978-1-4398-4614-8. Retrieved 25 June 2014. ^ "Trehalose supplier". Retrieved 14 June 2018. ^ Kohlmeier M (2003). Nutrient Metabolism. Burlington: Elsevier. ISBN 978-0-08-053789-4. Retrieved 25 June 2014. ^ Pinto-Bonilla JC, Del Olmo-Jimeno A, Llovet-Osuna F, Hernández-Galilea E (2015). "A randomized crossover study comparing trehalose/hyaluronate eyedrops and standard treatment: patient satisfaction in the treatment of dry eye syndrome". Therapeutics and Clinical Risk Management. 11: 595–603. doi:10.2147/TCRM.S77091. PMC 4403513. PMID 25926736. ^ Pucker AD, Ng SM, Nichols JJ (February 2016). "Over the counter (OTC) artificial tear drops for dry eye syndrome". The Cochrane Database of Systematic Reviews. 2: CD009729. doi:10.1002/14651858.CD009729.pub2. PMC 5045033. PMID 26905373. ^ Wiggers HA (1832). "Untersuchung über das Mutterkorn, Secale cornutum". Annalen der Pharmacie. 1 (2): 129–182. doi:10.1002/jlac.18320010202. ^ Tillequin F (July 2009). "[Trehala, a meeting point between zoology, botany, chemistry, and biochemistry]". Revue d'Histoire de la Pharmacie. 57 (362): 163–72. doi:10.3406/pharm.2009.22043. PMID 20027793. ^ Menzies FM, Fleming A, Rubinsztein DC (June 2015). "Compromised autophagy and neurodegenerative diseases". Nature Reviews. Neuroscience. 16 (6): 345–57. doi:10.1038/nrn3961. PMID 25991442. ^ Sharma J, di Ronza A, Lotfi P, Sardiello M (July 2018). "Lysosomes and Brain Health". Annual Review of Neuroscience. 41: 255–276. doi:10.1146/annurev-neuro-080317-061804. PMID 29661037. ^ Sardiello M (May 2016). "Transcription factor EB: from master coordinator of lysosomal pathways to candidate therapeutic target in degenerative storage diseases". Annals of the New York Academy of Sciences. 1371 (1): 3–14. doi:10.1111/nyas.13131. PMID 27299292. ^ Ballard JD (January 2018). "Pathogens boosted by food additive". Nature. 553 (7688): 285–286. doi:10.1038/d41586-017-08775-4. PMID 29345660. ^ Collins J, Robinson C, Danhof H, Knetsch CW, van Leeuwen HC, Lawley TD, Auchtung JM, Britton RA (January 2018). "Dietary trehalose enhances virulence of epidemic Clostridium difficile". Nature. 553 (7688): 291–294. Bibcode:2018Natur.553..291C. doi:10.1038/nature25178. PMC 5984069. PMID 29310122. Ballard JD (21 December 2017). "News and Views: Pathogens boosted by food additive". Nature. , discussing 2010 paper: Collins J, Robinson C, Danhof H, Knetsch CW, van Leeuwen HC, Lawley TD, Auchtung JM, Britton RA (January 2018). "Dietary trehalose enhances virulence of epidemic Clostridium difficile". Nature. 553 (7688): 291–294. Bibcode:2018Natur.553..291C. doi:10.1038/nature25178. PMID 29310122. .